‘Tis the season to be jolly, and we’ve got exactly the discounts to induce instant festive cheer. This holiday season, we’ve partnered with Write Editions to bring you a discount to help you slay those #readinggoals and make new ones for 2017. 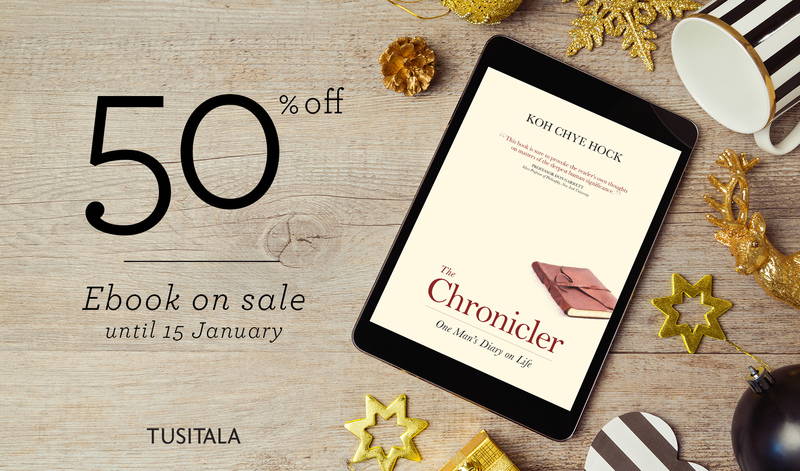 From now until January, take 50% off Koh Chye Hock’s latest ebook ‘The Chronicler’. No promo code required. If you like to end your year with introspection and a thoughtful read, this ebook is for you! “The unexamined life is not worth living” claimed Socrates. In this collective journal The Chronicler, author Koh Chye Hock opens the window of his mind as he distills for readers what he believes constitutes a purposeful, meaningful life, based on his 35 years of observing his own life, and others’. Succinct, perspicuous and provocative, the rich array of 225 aphorisms – on life valleys, plains and highlands – will set you thinking, contemplating and envisioning about your own life, and what it could potentially be. Readers will also be captivated by the life of Chye, who grew up as an orphan in the quiet town of Ipoh, Malaysia, to become a successful corporate lawyer in a multinational firm. Live an examined life. Get ‘The Chronicler’ at 50% off on all major ebook stores. If you haven’t already, sign up for our newsletter and you could be one of 10 lucky winners to take home a copy of Dr. Wilson Chew’s latest book ‘Differentiation‘ – hot off the press! Given the uncertainty that looms ahead in our economy, this is a vital read for business and leaders. Simply subscribe to our newsletter here – you’ll get first dibs on all the good stuff related to online/offline storytelling digital design once a month. We’ll announce our winners in January via email, and on our Facebook and Instagram. The age of disruption has arrived – fast and furious. Technological advances have revolutionised the global economy in ways not envisaged, engendering major established and traditional industries to wobble and slide. “Is it too late to do anything?” According to Dr Wilson Chew, author and leading corporate strategist, the answer is an affirmative “No”. A market that is being fiercely tested by disruptions is also a world bathed with opportunities. What is pivotal for leaders of enterprises big and small to ask is: “What will the future global economy be driven by, where will it take place, and how do I get a piece of the action?” In “Differentiation: How to Win in a Disruptive Market”, Dr Chew underlines the imperatives for companies to differentiate – in order to create value and win – through a series of compelling strategies, bold innovation and perceptive branding. Peppered with case studies and infused with Dr Chew’s insights gleaned from advising 250 fast-growing enterprises, this book aims to inspire enterprise leaders and readers to believe that it is all possible to reap the fruits of differentiation in a disruptive market when you’re determined to do so. You can also purchase the ebook version, which is available on all major ebook stores.